When you think of the National Guard and Reserve what do you think of? Commercials talking about citizen soliders, the phrase “The weekend a month, two weeks in the summer,” and those people called out for earthquakes, riots and floods. But there is so much more to who we are and what we do. When you are in a room full of military spouses at an event you are more than likely one of a few that are just like you, if not the only one. People don’t understand, even those that you think should often have no clue what its like. Events held for Military Spouse inevitably end up having almost nothing relevant to your struggles, and to hear of an event just for you is just something that rarely happens. But the wait is over! On September 22 an event is being help for spouses of all branches that are Guard, Reserves, or remotely stationed. At this event you will have the opportunity to network with other spouses, talk about your struggles, learn about resources that are available to you….but most importantly I hope you gain the confidence to advocate for yourself. 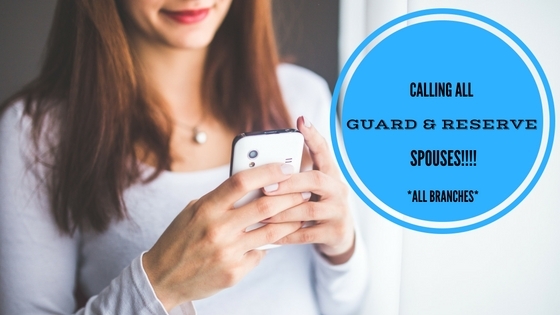 If you or someone you know are a Guard/Reserve Spouse, or are maybe on orders isolated away from a traditional base consider coming or spreading the word about SpouseTalks. This interactive event is designed to focus on the unique experiences that make up our unique lives. Each person brings their own unique story to the table and we want to hear that.